While on a recent mission our correspondent’s squad received a call from the Iraqi police that they had discovered a team of criminals burying an IED in the street. They disrupted the vile deed, and chased the perps. Meanwhile, guards were left to keep people away from the IED, and they asked for assistance to remove the explosive device. 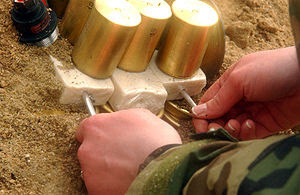 Our correspondent, having spent a year as a combat engineer and safely blown up many an IED and other ordnance, took a look at the thing and determined that pasting a little hunk of C4 plastique explosive and detonating it would eliminate it nicely. That is the safest thing to do with an unpredictable IED. Unfortunately, not in the engineers anymore, our correspondent no longer carried hunks of C4 in his backpack. So, they called in demolition specialists who arrived with a full team and a robot. The robot carried and set the C4 on the IED. Everyone took cover, and it was safely blown up. Our correspondent’s squad members, not having been that close to a real explosion before were mightily impressed with the power. To our correspondent, it was kind of piddling, but he went along with the spirit of the moment and acted impressed too. He made a mental note to contact higher ups about permission to carry a hunk of C4 in his backpack, for just such situations. Why bring in a whole squad with robots, and take up hours of so many people’s time? He could have taken care of the thing in five minutes. What efficiency! Sensible as this is, he doubts the higher-ups will buy it. Not such a bad thing for his many friends who would have one less thing to worry about. Kabul at night. It was the first time I had been out driving at night. These were the “danger hours,” when westerners were sternly warned to stay off the streets. Three Afghan colleagues had invited me for a pizza dinner in a place that secretly served wine and beer. What could go wrong? Well, two weeks ago an Italian woman had been dragged from her car and kidnapped. It was ten PM, and the usually packed city was deathly quiet – no lights, shops closed, sidewalks deserted. Dark buildings leaned over the street, making uneven cut outs in the thick blanket of stars above. Our tiny beat-up Mazda, jerked to avoid deep potholes in the street, like a tilt-a-whirl at a county fair. As we entered a roundabout lit by just two acid-yellow lights, one of Kabul’s mini wind storms blew a cloud of dust and paper across the street. Dim figures emerged, just silhouettes at first. It was 4 or 5 guys, in police uniforms, AK-47 automatic rifles in hand, waving at us to stop. It was a concern, because police uniforms can be bought in any bazaar for a few bucks– AKs too. I looked over my shoulder from the front passenger seat, looking for assurance from my friends in the rear, but they looked as scared as I felt. An armed guard, with his own uniform and AK-47, was usually back there. On this trip, out to a late dinner, we had decided it wasn’t necessary—and there wouldn’t have been room anyway. Great, this was the exact opposite of what I had been told not to do ever, since setting foot in Afghanistan– riding in a car, without a guard, late at night. I was toast. As the driver eased to a stop, rolled down his window, and snapped on the interior light, I instinctively laid my hands flat and open on my lap. I’ve made several long driving trips around the USA in the past 3 years, one in a camper van, the other staying in a wide range of hotels, from mom & pop ‘50s style motels to deluxe resorts. I totaled about 30,000 miles, and have visited every state except Alaska ( but soon). Rand-McNally 50 States Map Book–GPS units can’t give you the big picture about where you’re going. Paper maps are especially useful when seeking the back roads, and have no idea that a state road parallels an Interstate, and goes through cool towns, historic sites, quirkey museums, parks, lakes, etc. Google’s not good at finding multiple alternative and scenic routes. Allstays trip planning software– This lists thousands of quiet, off-the-beaten-track camping spots that can cost just a few bucks a night (some even free) in awesome places. The $25/year fee is worth it, and you can try it for free. Rand McNally TripMaker software– I looked at a dozen trip planning software programs. This was by far the best, because it allows 25 stop points per trip (Google has just 10!) and features accurate dragging to change routes (something no other software has been able to manage). And it’s totally free! Good Sam Road Service Insurance— In case of a breakdown, dead battery, lockout, or flat tire, Good Sam is the only service that will take you to the nearest service center, no matter how far away at no extra charge. Costs a bit more annually, but reasonable. Lose the spare tire—If you have decent road service insurance, they’ll tow you to the nearest tire place to either repair or replace your tire. Who wants to change a tire in a 110 degree desert or a mountain pass emergency lane anyway? Let a pro handle it, while you catch up on your email or journal. Also, it frees up several cubic feet of storage in your vehicle—enough for a camping stove, hiking boots, and more. Laptop Computer or tablet- It will help guide with the recommended software, and let you read articles, reviews, advice, etc. easier than a phone- unless you do all your data on a phone, and have forgotten how a computer works. Small 12v DC to 120v AC electric converter. This will power or charge your laptop off your car battery, while driving, or not. Get one with a couple USB ports for fastest cellphone charging too. Absolute necessity. It does use your car’s battery, so don’t overuse if the motor isn’t running. Cellphone small backup battery– One battery the size of a candy bar gives you a few extra hours. A lifesaver. LED Flashlight– Modern LED flash lights are cheap, small and powerful, and are critical when in a dark campground, trail, or low-budget motel. Cheap– keep a couple on hand. Swiss Army Knife– a basic model with screwdrivers, 3” blade, cork screw and bottle opener is enough, and will get regular use. Wide-brimmed hat with a chin strap— These were designed for the sunny, windy West, where a freak 30 mph gust can blow your hat down a cliff or across the highway. Keeps the sun off your face and neck too. Think cowboy hat, but get high-tech rain-proof, washable and vented version. Lightweight rain jacket with hood– This can be stuffed in a small bag, but they can keep you warm and dry. Even in July, in many places the wind blows cold and fierce, and a windbreaker with a tightly corded hood is a life saver. Cottonelle packets– Cottonelle is one of the only flushable hand and tp wet wipes. They’re great in a tp emergency, or when you splash gas on your hands, eat a chili dog, or run into a friendly licking dog. Remove the wipes from the packet and put in a Ziploc bag to keep them from drying out. Suntan crème—The sunny West can give Easterners a big burn fast, even with a hat. Don’t fool around, use 50+. Meds—I have a tiny plastic bottle 1”x3” with a screw cap for 3-4 each of Advil, aspirin, antacids, and even an Imodium (learned this on a 14 hr. flight that ran completely out of toilet paper half-way through)—or whatever your body may need. Put it in your carry bag with phone, wallet, etc. for when you’re far from your suitcase or a drugstore. Tiny umbrella—6” versions take almost no space, but help with unexpected downpours. Rainex—This windshield treatment works miracles to help you see in the inevitable rainshowers. One application should last a month, so you may not even need to take it on a trip. (Be sure your windshield wipers are in excellent shape before hitting the road). Extra windshield washer fluid and Doobee—I take a whole gallon in my trunk. Bugs are the biggest problem—especially in humid sections of the country– along with dust, mud, and pollen. The Doobee is a plastic scrub pad that removes the toughest solidified bug proteins that cloths or paper towels can’t. Consider also a spray bottle of heavy duty bug remover, especially in more humid areas. Snacks & Drinks– Sometimes you’re far from food at mealtime, and having something to get you by is a big help. Don’t get something that goes gooey in heat. Trail mix is the best. You can even make your own and it lasts weeks without refrigeration. Any smart phone is a necessity. I have a Samsung Android, which is frequently slow and unpredictable, and changes settings randomly, but it is cheap! Get one with a compass (many cheap ones don’t). Google Maps- What all GPS units use, so why not just use your phone and know you’re always up to date. I had a better paid phone-based navigation apps, that provided 10 times the info of Google Maps. But it had an annual fee, so Google drove them out of business with its free, but inferior product. Like all Google products, their goal is to make money, so you’ll be deluged with ads getting in the way—instead of one annual low fee. I always scope out my route on a large paper map first, then let Google maps handle close-in guidance. Google maps are best in Interstate highway mixing bowl intersections in big cities like Dallas, Atlanta, and Denver. Mobil Hotspot- Most cell phones have this built-in, and allow you to use your computer to access the internet without a wi-fi connection. It can eat a lot of data, but road warriors shouldn’t worry about data use. Be sure to bump your data plan to at least 8Gb. Your cell connection is your lifeline, and if it costs another $20/month to use your computer just about anywhere, it’s a valid expense. Wi-fi calling- This allows you to make phone calls and texts without using cell data—if you can switch to an available wi-fi network. This means you probably won’t pay for calls and data. It’s a great feature in places with no cell service, that have wi-fi (most places these days). It can save many Gbs of data charges. Most phones include wi-fi calling, but it’s a little hidden. On an Android, go Settings>Advanced Calling>Wi-fi Calling. Turn the switch to Prefer Wi-Fi. My phone regularly turns off Wi-fi calling on its own. I suspect Verizon discourages it, because it makes a big dent in their income. So check the setting regularly, to save $$. Now, many cheapo motels and campgrounds have terrible wi-fi, so you may occasionally need to use cell data—another good reason to bump up your data plan during your travels. Compass—I discovered too late that my cheap Samsung phone didn’t include a compass. All road warriors should have a compass at their fingertips always, even a mechanical one. Too many times I’ve made a wrong turn on a lonesome highway, and discovered 50 miles later I was heading North, not South. Grrrr…. A practical carry bag is usually just big enough to carry a tablet computer (9”x12”x4”). It’s suitable for wallet, phone, keys, pens, notepad, batteries, small camera, water bottle, orange, energy bar, map, guides, flashlight, business cards, tiny umbrella, meds, comb, pocket knife, and other small items. It should have a wide strap to sling it across your shoulder. It’s good for carrying in restaurants, museums, shopping, bus tours, and short hikes. Unlike most bulky backpacks, you can set on a chair or table, or your lap, without taking much space, and it doesn’t look like you just stumbled in off the trail. On longer hikes, a small backpack is more comfortable, but I’ll often just stuff my carry bag into it, and still have all my organized necessities. I have an Eagle Creek that isn’t sold anymore. But you’ll find a good sub with a little digging. View of Kings Canyon National Park, looking east into the High Sierras. This is what really makes America great. Let’s keep it. Cellphone booster– These can cost hundreds of dollars, so I don’t use them, and they have limitations. Mainly used by truckers on long hauls where there can be huge gaps in cell service. First Aid Kit—Though I have one stuffed away in my trunk, I use it less than once a decade. Stuff a few band aids in your carry pack instead. Anything else will probably require a trip to an Urgent Care Center. In the summer of 2016, before we had ever visited High Cove, my wife, Catheryn, and I, after a morning hike on Roan Mountain, stopped in the tiny town of Bakersville, NC for lunch at Helen’s Restaurant. A fellow came in with an armful of corn meal sacks, and left them on the counter. I asked the server where the sacks came from, and she said there’s an old mill down the road. She said the delivery man, Jack, actually ran the mill, and we’d catch him there if we wanted a tour. Cane Creek flows over the mill dam. This is right after a big rain, so lots of water in what is usually a very placid creek. Jack is walking up to check if the water gate into the mill race is clear. We spent several hours listening to Jack’s stories, about his great granddaddy who built the first mill around 1847, about his plowing steep and stony fields behind a pair of horses as a teenager, about how he ran away at age 17 to join the Air Force, was trained as a bomber mechanic, spent 4 years in the Korean War, got an engineering degree at NC State, worked for Werner von Braun writing software for the first moon launch, and finally on IBM’s first PCs. Quite a life for a country boy. Werner von Braun and team examine the computer that guided the first Apollo mission to the moon. It was one of the first digital computers. Jack was on the team that wrote the software. When Jack retired from IBM in 1997, he returned to the mill he hadn’t seen in 44 years. It had been neglected since his daddy died in 1955, and was in ruins from floods, snow storms, hurricanes, and could barely be seen through decades of untrimmed trees and undergrowth. But something got to him, and he dedicated the rest of his life to bringing the mill back to the way it was in 1867. Jack’s great-grandfather, his grandfather and father all ran the mill. All the mill’s machinery was originally built in the early 1860s. I’ve traveled many places, working on documentary films. Jack’s was as wonderful a story as any—and it was nearly in my back yard. I returned a few weeks later to begin filming, and hear how his family scraped a living off the Blue Ridge Mountains of North Carolina for five generations. It was not unlike Medieval times, where everyone had to make or trade everything, and cash money didn’t exist. Summer quickly turned to fall. Jack shut down the mill in late October, and drove to Florida, to join his family. He’d return in April, when the mountains became more hospitable to 86 year old men. Due to work and family commitments, I couldn’t return to filming until mid-August, 2017. I spent a few days every week filming, and living the adventures of a grist mill, while spending nights in the High Cove Community, which was just a few miles and 2-3 ridges away. The documentary film has become a larger story than expected. The mill is an amazing machine, needing constant attention. Though driven by a little water brook, it is immensely powerful, and can kill you in an instant. Many times I put down the camera to help Jack maintain the mill, oil the gears and flywheels, and axels, push the 4-ton water wheel to give it a jump start, and adjust the various water gates. I joined the pace of the mill. It tells you what to do, and you go along with this ancient, creaking, groaning monster. When a 40 ft. belt on the mill broke, we traveled up and down a dozen ridges, across two counties to find an old-timer—someone Jack had grown up with back in the 1930s. He operated sawmills a long time ago, but might have a big belt, stored in a barn filled with dusty doo-dads from a hundred years ago. Mountain people never throw anything away. Jack Dellinger at the mill in August 2017. He’s smiling, which means the old beast is behaving. Each short trip became an extended visit. When Jack met a friend (and he always did), I was in a foreign country, in another time, listening to another language. I felt privileged for such a first-hand view into Blue Ridge mountain culture. Between the breakdowns, the visits, and storms that clogged the water works, there were many days I didn’t feel I was making progress. But as I met Jack’s numerous friends, neighbors, distant cousins, local characters, and casual tourists, the story became so much richer, and I thought, what the heck have I gotten into? Where is this film going? How do I manage such a rich culture? It started to become much more than a film about a mill. The corn hopper revealed. The stick on the left is the ‘DAMSE;L’. Named in the middle ages because it chatters like a woman when shaking the corn kernels onto the massive grindstone. Since the mill has now closed for the winter, I can explore the many hours of video, and make plans to fill in the gaps. I’ll drive down to Pensacola and film extended interviews with Jack—so all his stories get recorded. I want to interview others involved with the mill and other parts of Jack’s life, while the mill is closed. This includes Kate, his new 23 year-old miller apprentice, who is fast becoming an important character in the mill’s preservation (it is on the list of National Historic Sites) . In the spring, I’ll return to the mill with my list of ‘must-have’ shots. I have been playing around with some shots set to music, which is the video attached here. RECOMMENDATIONS FOR INDIE NETFLIX STREAMING FILMS; EXCELLENT, BUT MOSTLY IGNORED BY CRITICS AND MEDIA. Friends have asked how I pick them. Here’s a list recommended by pro film writers. Begin with (*) titles, which I’ve seen and loved. In no specific order: HUNTER GATHERER*, A WOMAN A PART, I BELIEVE IN UNICORNS, KING JACK, MEN GO TO BATTLE*, MISS STEVENS, THINGS TO COME, TRAMPS, THE TRIP TO SPAIN*, LOOK WHO’S BACK*. I taught ESL one summer to Mexicans in the US. They said they moved to the US, and had no respect for anti-immigration laws. They said they were justifiably reclaiming the land stolen from them in the 18th and 19th centuries, by white Europeans. No matter how many times they were deported, they would still return, until the white Europeans thieves were willing to share it. They had a point. I’ve been reading a history of the Cherokee “removal’ from the South in the 1830s, authorized by president Andrew Jackson and Georgia governor George Gilmer. Trump really does reflect the dastardly deeds of Jackson and Gilmer. The US government ignored treaties, ignored the US Constitution, ignored land and livestock theft, destroyed homes, encouraged violence, and permitted torture and murder of the Cherokees, the native people, so they could steal their land. Their final solution inspired Hitler and his Nazi genocide in Eastern Europe 100 years later. Jackson’s Trail of Tears forced winter march killed thousands of Cherokees. Trump’s threats to remove 11 million American residents has a similar ring. Found on the way through the Crow Reservation (Hwy 212), this ruined ‘teepee’ must have once been a roadside attraction. But the Plains winds and neglect give it the aura of so many sadly deteriorating places in America. After spending the night at Little Bighorn Battle Field with the Lakota and US Calvary re-enactors, I headed back to the Monument Headquarters for a Crow-native guided tour of the battle sites—told from the Native point of view. The guide was one of the tribal officers, who led the tours in a small bus as a community service. This monument in Little Big Horn National Park, according to the small tag at the bottom, was erected before any thought was given to the rights of Native Americans. It said ‘hostile Indians’ was an inappropriate slur, but Montana statutes forbid any alteration to the public monuments, and so it stays. There’s still a strong anti-Native undertow throughout the West, I discovered many times. It was a top-drawer tour. We stopped at several places on the ring road as the guide gave very detailed descriptions of the battle. This is a unique battle field, because after the battle, most of the Cavalry were buried in unmarked shallow graves where they fell. The graves were quickly hidden by dense grasses. A few years later, marble markers were set by the graves, but there were many doubts about the accuracy of their placements. In 1984, a wild fire cleared the dried grasses across the entire battlefield. This allowed archeologists to thoroughly search for artifacts, and they created an accurate map of the battle. Seeing how groups of a dozen grave markers shrunk to pairs was testament to how the soldiers assembled for safety, but as groups were decimated, many fled, and were cut down—explaining the many single outlying graves. The Plains Indian War was a fearful posting for experienced soldiers, because of the danger of ambush, insufficient food, scarce supplies, and inadequate arms. For example, while the Indians had acquired modern repeating rifles, the soldiers had only single-shot muskets. Most of the soldiers were recent jobless immigrants from Europe, Britain and Ireland. They joined the cavalry to eat, not suspecting the horrors they would face, nor the irony that they had fled their homeland due to genocide carried out by the English on their native minority. After the early-morning tour, I ate breakfast at the ‘Custer Battlefield Café’ in the nearby town of Crow Agency. It was part of the Crow Indian Reservation, and the restaurant/gift shop was tribe-owned. Eric, a fellow traveler with his faithful dog, they were driving in an old Cadillac from New England to Southern California, to look for America. I met another traveler, Eric, who was driving the back roads, just with his dog, from Connecticut to San Diego in a late model Cadillac. They pulled over whenever he was tired, and slept in the back seat. Eric was a freelance campaign manager for Democrats across the country, and so depressed by the recent election loss by his people, that he hit the road, without a plan for the future, thinking that America was now doomed. Eric insisted that on my way back, I should visit Wounded Knee, on the Lakota Pine Ridge Reservation—where he had just come from. It was one of the most emotional moments of his life. The drive there, over the Blue Highways of Montana and South Dakota, was long and stunning in its remoteness. No exits, no towns, sometimes for stretches of 75+ miles. I spent the night outside the Donner Pass town of Truckee. After 12 days on the California coast, it was surprising to see there was still plenty of snow in late June. In the morning, I drove I-80 nearly the entire length of dry-bones Nevada through Reno, Fernley, Lovelock, and Imlay, finally landing in God-forsaken Winnemucca, where I stayed in one of the hemisphere’s ugliest RV parks. After dinner at possibly the greasiest Mexican restaurant ever, I walked through downtown, which had the saddest little strip of casinos in the hemisphere. I went into one that was, with a fistful of quarters, but saw that slots the machines had gone boring digital with credit card thingies for money. Plus, as with everything digital, they had a million choices, and I had no idea how they worked. Gone was the satisfaction of plunking in a quarter, pulling the arm, coaxing the spinning wheels, and hearing 3-4 or 100 quarters jangle into the metal coin tray, like little bells from heaven. No fun there. The handful of players scattered around the dark rooms were mostly grim-faced solitary middle-aged women pulling on cigarettes and sipping raspberry vodkas. This stretch of I-80 is desolation row, passing ghost towns like Battle Mountain, Beowave, Golconda and Valmy. Then you zoom by the little city of Elko, which according to Wikipedia “is also home to legal prostitutes and contains active brothels. Several geothermal features are located in Elko, the largest of which is the Elko Hot Hole.” In winter, you can ski for $20. About 80 miles from Elko, at the only town in the West with two Flying J’s on the same exit, I turned north onto US 93 North. One of the great American desert highways, it runs mostly two lanes for 1,457 lonesome miles from Phoenix to Canada, crossing five Interstate Highways, and passing hundreds of ghost (or nearly) towns. On the border, there is Jackpot, Nevada, which has a 15 story hotel ‘convention center’ that lures gamblers from Twins Falls, Idaho to this D-grade border sin city. Then, the West blossoms into Idaho, which has some of America’s most bizarre natural features. Craters of the Moon National Park, St. Anthony Dunes, and the back end of the Rockies. The ghost towns and sleazy casino villages of Nevada are replaced by refreshing views, lakes, and electric green fields of wheat and potatoes, and Nuclear Reactors. A bit further up the Road, I passed a little time with this vagabond couple at a Flying J in Twins Falls (they were thumbing their way to Vermont). Idaho has its share of lonely roads, if you like to feel alone in the world. And one of the most bizarre sights in the USA, Craters of the Moon National Monument. Hundreds of square miles of volcanic cinders line the road. The most recent flows were just 2,000 years ago. Not a place to be barefoot. Idaho was one of the most surprising places, I’ve ever been, but the potatoes I had weren’t the best, and they’re not promoted much. But then again where will you find a landscape that looks like a herd of dinosaurs just took a dump. This young lady wants to be at the center of one of the earth’s most breathtaking views, the Norris Geyser Basin in Yellowstone National Park. She’s not enjoying the scenery, but watching herself on her phone. I love the US National Parks. So do many people around the world. They are packed with international tourists. Buses are full. Especially of Japanese. Watching them juggle selfie sticks,create the perfect facial expression, arrange their colorful clothing just so, then finally snap themselves looming in the foreground of every corner of the park, oblivious to the real world around them, fascinates me. The young lady in yellow again, with an enigmatic smile. The bubbling pools don’t grab her attention much. The person in the foreground is on the phone– of course! Historical note: Travelers once got to know each other by asking strangers to take their photo. A recent article described obsessive selfie photographers, as budding sociopaths disconnected from the real world, and unable to appreciate anything their big face on a 5×4 screen. They visit scenic places but never really see them, and never really experience the intense emotion of being there. Every event is a selfie event, to be captured for later, or maybe to impress acquaintances, waiting breathlessly on Instagram. The author mentions that at rock concerts, the audience is a sea of cell phone watchers, and nobody is really there. Love the very serious expression on the young lady in the foreground, not to mention her stylish dress, hat and sunglasses. The guy in back, also seriously contemplates a high angle shot, while his partner, of course, watches her phone. The pink lady on the left scowls— maybe at me, or was it breakfast? I’ve seen Japanese tour groups at hotel restaurants to eating an all-Japanese cuisine meals. Maybe hotels specialize in that to attract the Japanese tour bus trade. The little thing in her right hand is a plush toy bear. My all-time favorites! All I can say is, HUH? This couple make an interesting composition. White hair vs. black hair, but matching outfits. Incredible geyers and pools in the background. His glasses up, hers down. Could be he’s narrating a video, live. Nice. OK not a selfie, but the grey face mask was a revelation. She didn’t look like a Muslim, and the bright, giant brim hat seemed un-Islamic. After a little googling, I found that color-coordinated masks were an emerging fashion statement in Japan. The future is here. Except her camera looks pretty vintage. I suspect she was a Japanese fashion model on a secret shoot in Yellowstone. Hope it get to the USA soon. Why should antifa have a monopoly? OK, not a selfie either, but on the same stroll. I heard this young family speaking French, and their clogs, cute outfits, and shades made them look well-put together. No phone or selfie stick– even the kids. They seemed healthy and happily occupied in this breathtaking setting, hands free, interacting with their each other and the surroundings, and not self-absorbed with their friggin’ fones. Vive la France. A friend called Sunday afternoon, while I was crossing Montana on the way to the Pine Ridge Sioux Reservation. He recommended I should make a 100 mile detour to Little Big Horn Battlefield, because it was the 141st anniversary of the death of Gen. George Custer. I arrived at Crow Agency, Montana and found a re-enactment of the battle, from the Native American perspective, was scheduled for 1 pm. It was 5 pm, and the grounds were empty. I went back to the tribal-owned café for dinner, and think about where to spend the night. Three ladies sat at a table near me, and we struck up a conversation about the re-enactment. One of them owned the ranch on the Little Big Horn River, where it had taken place. She invited me to camp where about 75 re-enactors were still cleaning up, and spending the night. I could stay with them. This is the first version of the Confederate States of America flag. It was later changed. I don’t know if it was a political statement or just part of an authentic 7th Cavalryman’s kit. The re-enactor was an authentic knowledgeable guy. Interesting that Custer was in the Union Army, but this battle was fought June 25, 1876– well after the Civil War ended. At that time, posting on the empty, cold, and dry Montana hills during the Indian War, was the worst assignment a soldier could get. So the US Cavalry there was mostly foreign immigrants and disaffected ex Confederates– so they flew the first rebel flag. 5-star interesting man. Born in Israel. Moved to US as a young boy, but didn’t feel welcome or comfortable with white US culture. Ran into a Lakota Sioux Chief in Los Angles, whose son had just died after struggling with alcoholism. He told the chief he would like to be his son, and was then raised in LA as a Lakota Sioux. At 18, still an Israeli citizen, he had to return to Israel to serve in he Army. It was a terrible experience, and he returned to the US with severe PTSD. The Sioux community welcomed him back, and took care of him as a wounded warrior. He completely identifies with the Lakota community and shares their rich spiritual life, — he’s also a successful electrician in LA. But his passion is reenactments. Spellbinding fellow. Another LA resident, this man is a Lakota Sioux community leader. In the summer he leads reenactments. In the winter, he is a school security officer in East LA. He’s an expert in Sioux culture and history. Film and TV casting agents in LA call him when they need Native background players, and he brings trained people of all ages with their costumes, gear, and stage training in 19th century warfare, including shooting, riding, and safe hand-to-hand combat. He urged me to come back next year and spend a week with them. They were welcoming, warm, but firm and professional. What amazing people, and what hell the white people put them through. How well they treated a stranger like me. Custer’s last stand, at the Battle of Little Big Horn is a famous moment in US history. It was part of The Indian Wars, 1610 to 1924–310 years. In school, I learned that Indians were treated fairly by benevolent ‘pioneers’- Thanksgiving and all. On the other hand because they were ‘uncivilized savages, attacking white settler families’, whose only fault was they were taking the Indians’ land, they had to be put on reservations. The U.S. Calvary School was formed by modern US Army Cavalry veterans to instruct re-enactors in the methods of 19th century 7th Cavalry. They use authentic gear and uniforms, and teach theatrical combat and horsemanship skills to intensely interested individuals– men and women. The school participates in re-enactments across the U.S. They have appeared in dozens of films and TV shows. Interesting dudes. Most are serious historians and live to display and discuss their work, uniforms, arms, horses and camping gear. They act out their aggression in a safe, entertaining, and profound past time. Touring Indian reservations from Eastern NC to the Pacific coast, seeing and reading their side of the story over many years, I’ve decided that all I’d learned about Native Americans in school had been a lie—to make white people look good, and excuse their own violent conquest of the Native population. This was the campsite where re-enactors- both Natives and Calvary set up their period tents, slept, ate, dressed, took care of their horses,gear, and tack, and prepped for their battle re-enactment. During the Indian wars, the US government spent the equivalent of many billions of dollars, removing millions of Indians from the rich hunting and farming lands, which they had occupied for 10,000 years. To do this, the government used broken promises, theft, and mass murder. It was violent conquest and genocide. Nothing to be proud of or patriotic about. This is a combined group of Indian and Cavalry re-enactors. I sat with them for 3 hours keeping warm by the fire in the Montana night chill. We discussed Custer, Indianative/white relations, history, horses, arms and stage fighting. They were pros, and preferred trained re-enactors. Though their knives and spears were rubber, and the guns shot blanks, an untrained person could be dangerous. In this reenactment, one Indian was accidentally shot point blank by a volunteer, and got a pretty bad powder wound in the chest. Injuries abound when over-enthusiastic volunteers lose their heads in the heat of the ‘battle’. These guys were pros, and had an aura of confidence and dedication you rarely see these days. This young man was a Montana rancher who loved working as a Cavalry reenactor. I’d never seen a person so at home with a horse. He didn’t use a bridle or saddle, could stand on the horse’s back and ride sideways or backwards and turn on a dime. He seemed to direct the horse with invisible instructions. I asked if my flash bothered his horse. “Naw.” When he heard the men sitting by the campfire grumbling about the need for more wood, he quietly guided his horse over to the trees, pull down dried branches and tossed them to the fire. He was pretty quiet, but always listening and figuring a way to be a part of the campfire group. A real cowboy– in his element– no smart phone, no video games. All natural in a natural place. Reenactors make their own clothes, tents, sometime shoes, etc. Washing in the Little Big Horn River. The Indians were camped above the river, which helped defend from the cavalry. This young lady had been working with the Calvary School for years. She was a school teacher, but in summer worked reenactments. She was passionate about horses and everything about them– cleaned all the tack and organized it lovingly in crates to be ready for the next battle. They were an amazing group: US Calvary re-enactors and Sioux re-enactors. Serious living historians. I introduced myself, and was welcome to hang, shared buffalo jerky, and their other foods on a bench around a campfire where two battle foes got along in a way that would have pleased Jesus Christ himself. It was an incredible experience, and one I’ll return to next July—at their invitation. It deserves a book, but for now, here is a gallery to help tell the story.